This page details the CNA salary in Idaho for different cities and health care jobs located throughout the state. Choosing to become a certified nursing assistant in Idaho is a good idea because it’s a rewarding as well as a secure career. The employment outlook for CNAs is positive especially since it is expected to increase by year 2020. The population of the aging population is increasing and so is the demand for quality health care which is rendered by CNAs under the supervision of LPN, LVN, or registered nurses. The salary of certified nursing assistants in Idaho ranges from $18,000 to $28,000 with an average salary wage of about $24,340. The mean hourly rate is approximately $10.93. The salaries offered to CNAs are reasonable for them to live in the area. However, being an entry level position it may be a good idea to gain experience and then seek out advanced certifications to earn more. At the beginning, the initial pay is low. This can increase by gaining higher education as well as work experience. There are small private agencies who prefer undergraduates but keep in mind that they too will receive lower pay rate. Is is advantageous for certified nursing assistants to have work experience in order to get offered with excellent salary. Entry-level or beginner CNAs are paid a lesser salary wage compared to CNAs who already have work experience. The location of the job is also considered among one of the reasons for the salary variations of certified nursing assistants. The salary CNAs receive depend on where they work either in nursing hoes, hospital, healthcare clinic, or private clinic. If you work at a medical institution then you have greater chances of getting higher pay. Working as a private nursing aide will also give you high earnings. Woking in cities will let you earn larger amount of salary compared to working in rural areas because of the cost of living. The employers in Idaho offer bonuses as well as benefits to certified nursing assistants in order to motivate them in their performance of their duties when rendering services to various clients. Yearly wages can vary depending on the cost of living and other factors. The healthcare sector is regarded as one among the growing industries these days. One of the major reasons for this is that there are several individuals who make use of the healthcare services. 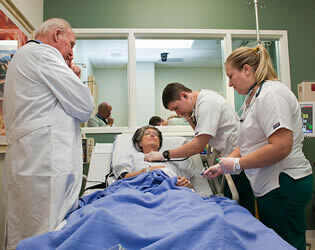 This in return will require an increased demand for health professionals including the certified nursing assistants. To get more information about how to become certified check out our CNA classes in Idaho page to get started. Schooling will consist of training for the medical skills used on the job as well as preparing you for the state license exams.